EARLY CINEMA COLLECTION - Wooden Box Set: THE CABINET OF DR. CALIGARI (1919), THE GOLEM (1920), NOSFERATU (1922) and THE PHANTOM OF THE OPERA (1925). CLICK IMAGE FOR DETAILS. Midnite Movies Double Feature: THE EARTH DIES SCREAMING (1965)/CHOSEN SURVIVORS (1974). CLICK IMAGE FOR DETAILS. Outstanding effects by master Ray Harryhausen in this sci-fi classic. Now in restored black and white and colorized versions. CLICK IMAGE FOR DETAILS. Stars Rose Hobart, Charles Bickford, George Renavent and Lopita Tovar (the Spanish DRACULA). A rare Universal title from the same year they made DRACULA and FRANKENSTEIN. CLICK IMAGE FOR DETAILS. Stars Hally Chester, Donald Haines, Dave O'Brien. The film that started the East Side Kids series. An underworld gang lures some street kids into a counterfiting circle. Lightweight cardboard packaging. Two films starring The East Side Kids with Leo Gorcey and Huntz Hall: THAT GANG OF MINE (1940) and CLANCY STREET BOYS (1943). Plus bonus vintage cartoon: THERE AUTO BE A LAW. Starring Leo Gorcey, Huntz Hall, and Bobby Jordan. Three feature films with the East Side Kids: SPOOKS RUN WILD (with Bela Lugosi), BOWERY BLITZKRIEG, and SMARK ALECKS. GHOSTS ON THE LOOSE (1943) The East Side Kids and Bela Lugosi in a comedy spook show! Lugosi "haunts" a house the boys are fixing up for newlyweds. SPOOKS RUN WILD (1941) Bela Lugosi plays a Dracula-type mystery man who slinks around an eerie old house and sleeps in a coffin. Okay, it's a lot of fiction and Lugosi might not have been as abrasive as he's depicted here. But, as a Hollywood fairy tale, this is sheer brilliance. CLICK IMAGE FOR DETAILS. 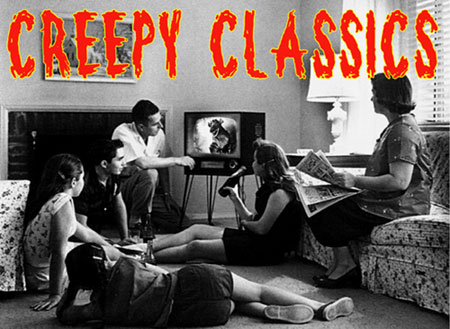 Five of the classic Ed Wood horror films from the late 1950s. CLICK IMAGE FOR DETAILS. EDGAR G. ULMER: THE MAN OFF-SCREEN (Documentary) A 77 minute in-depth look at the mysterious life of the low-budget filmmaker Edgar Ulmer. Plus, his film ISLE OF FORGOTTEN SINS (1943). CLICK IMAGE FOR DETILS. CURSE OF THE YELLOW SNAKE (1963) An Edgar Wallace mystery thriller with a mysterious cult group after the control of "The Yellow Snake." Plus, THE PHANTOM OF SOHO (1962) A phantom killer stalks the underworld of Soho. The killer wears a hooded cape and hideous skull mask. A caveman has survived evolution and aging for thousands of years on the California desert all alone. CLICK IMAGE FOR DETAILS. Five DVD Set: Starring Omri Katz and Justin Shenkarow. A young boy, Marshall Teller, moves from New Jersey to a place called Eerie, Indiana. He soon finds it to be the center of weirdness in the universse. CLICK IMAGE FOR DETAILS. Stars Rod Cameron and Mary Murphy. Electronic brain control that turns people's lives into living nightmares. Cameron investigates to find a hidden world of horror. Psychotronic, man! Also known as: THE MONSTER OF VENICE. Stars Maureen Brown and Gin Mart. Creepy Italian film with a cloaked madman who wears a skull mask and black robe lives in an underground sub-basement below a monestery. CLICK IMAGE FOR DETAILS. A touching, thoughtful magical fantasy of the heart. A scarred war veteran that is now found repulsive retreat to a cottage where he would have honeymooned. Meets an unattractive outcast maid...the cottage and their hearts work something magic. Subtle changing make-up make this a special film. A cross between The Twilight Zone, Night Gallery and Ripley's Believe It or Not! Rod Serling's hosts "true life" ghost/horror stories. Supernatural vengeance on three college students, a weird, dark hole in the earth with something evil down below, a bridge and a ghost girl. A movie with a strange history. It began as a proposed three our film made in France. After disapproval by studios, it was reworked. A pseudo-science fiction documentary! A comet heads to earth and causes mass destruction on our planet (like the film WHEN WORLDS COLLIDE). Very odd. EQUINOX (1970 theatrical release)/THE EQUINOX - A JOURNEY INTO THE SUPERNATURAL (1967-1969/Original version of the movie) Very low budget movie filmed over a few years and released in 1970. Shades of H.P. Lovecraft stories. CLICK IMAGE FOR DETAILS. A double feature of two early Stroheim films. THE GREAT GABBO and BLIND HUSBANDS. CLICK IMAGE FOR DETAILS. Remastered edition of the third movie on the series starring Roddy McDowell and Kim Hunter. Includes trailers from the original series of films as a bonus too. Wacky Japanese twist on Superman. Alien superhero, Starman takes on an evil scientist with an atomic-age brain. He is challenged by hideous aliens called Marpetians. Zap! Claude Rains and Fay Wray in a little known supernatural film. Rains is a phony mind reader who suddenly begins to have real visions and revelations to his dismay and torment. Boris Karloff narrates the first fantasy fairy tale in this collection - The Emperor's Nightingale. It's a puppetmation treat. Also included are Ray Harryhausen's stop-motion shorts. CLICK IMAGE FOR DETAILS. Two low-budget science fiction films from the 1970s. EYES BEHIND THE STARS (1978) has aliens abducting humans in dense woods with a horrifying government cover-up. UFO: TARGET EARTH (1974) A young scientist gets too close to an alien race that have landed deep in a Carolina lake. Stars Edward Arnold and Donna Reed. A blind sleuth uncovers the mystery behind a series of crimes that escalates to murder and mayhem. Stars Peter Haskell, Joan Bennett, Barbara Rush, Adam West. A man with ESP that enables him to see into the world of the dead is enlisted to solve murder. He's asked by a young woman to see beyond and into her brother's death. A made-for-TV supernatural mystery-chiller from the 70s. Finding this movie is like finding some forgetton curiosity in the bottom of an old dusty chest that had been sitting in an attic corner for years. CLICK IMAGE FOR DETAILS. Poetic and gruesome European horror. A country doctor tries to restore his daughter's beautiful face after an accident. CLICK IMAGE FOR DETAILS.